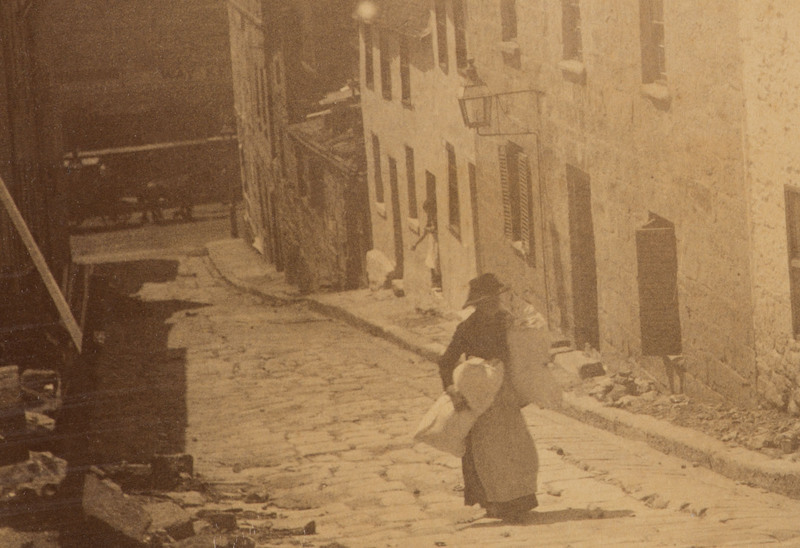 There is an almost Dickensian mellow dramatic feel to some of these 1880s-1900 albumen photographs by Sydney photographer Arthur K. Syer. 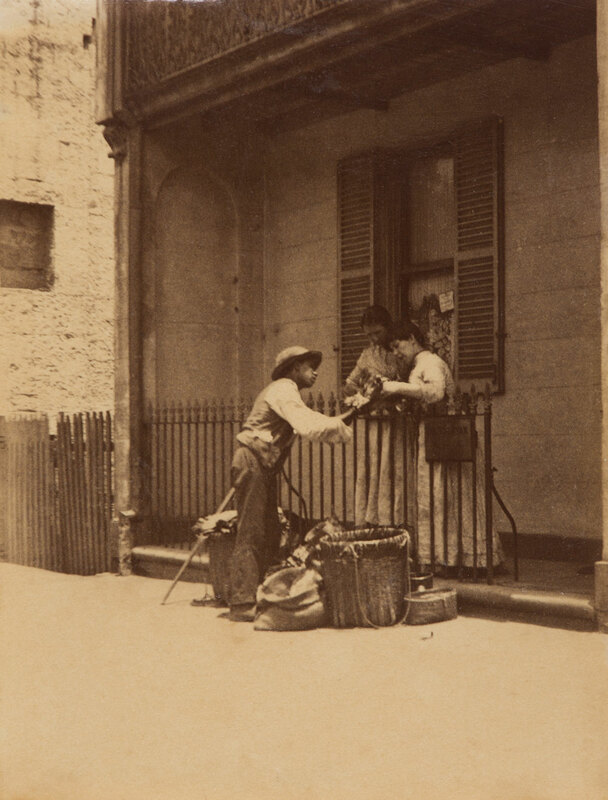 While the photographs offer a unique point of view (low down by the waist) of Victorian era Sydney, you get the feeling that Syer was more interested in the fact that his camera was hidden, and the game he was playing to get these photographs, than in the visual construction of the images themselves. 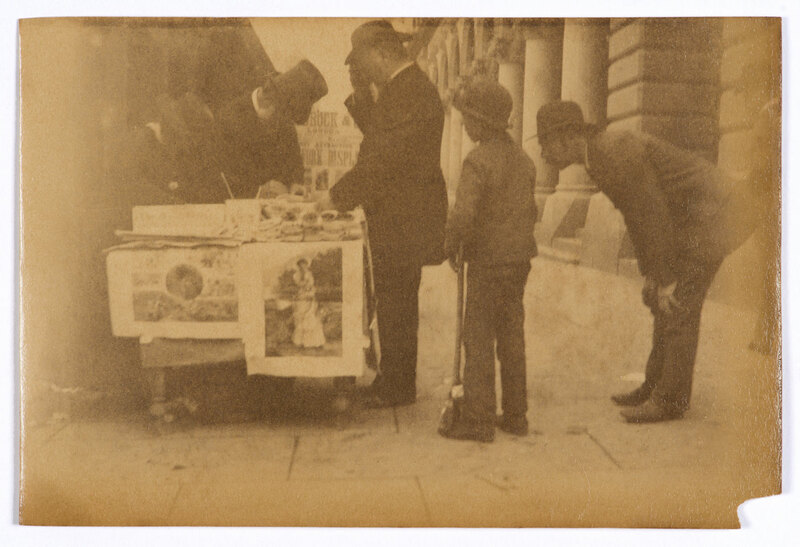 The best of them are photographs – such as Hawker haggling with customers, with its links to the photography of Atget, and crowd scenes like Men in street, where the different poses of the men and the rising and falling of the six items of headgear – which offer a rhythmic consideration and interest that other photographs in the posting lack. 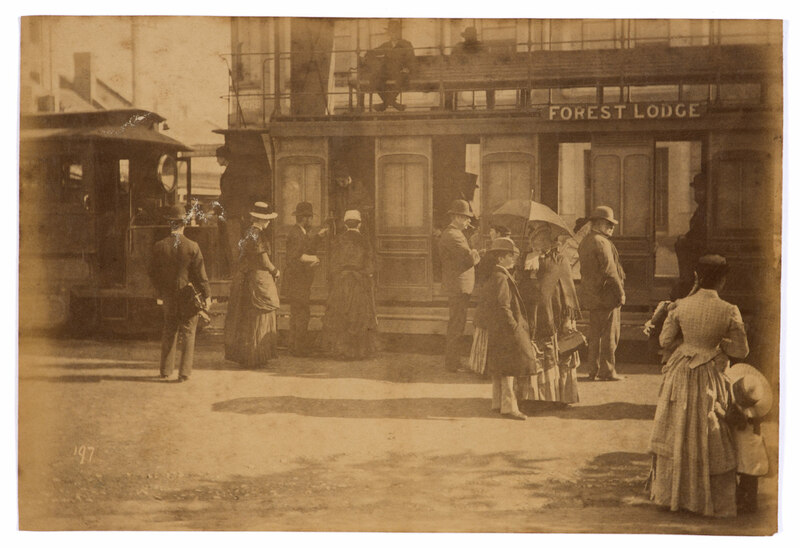 The gem in this group of images is the outstanding Forest Lodge double decker steam tram stopped on Elizabeth Street near Supreme Court N.S.W. Again, it is the attitude and rhythm of the protagonists within the image frame that makes this diorama so engaging. 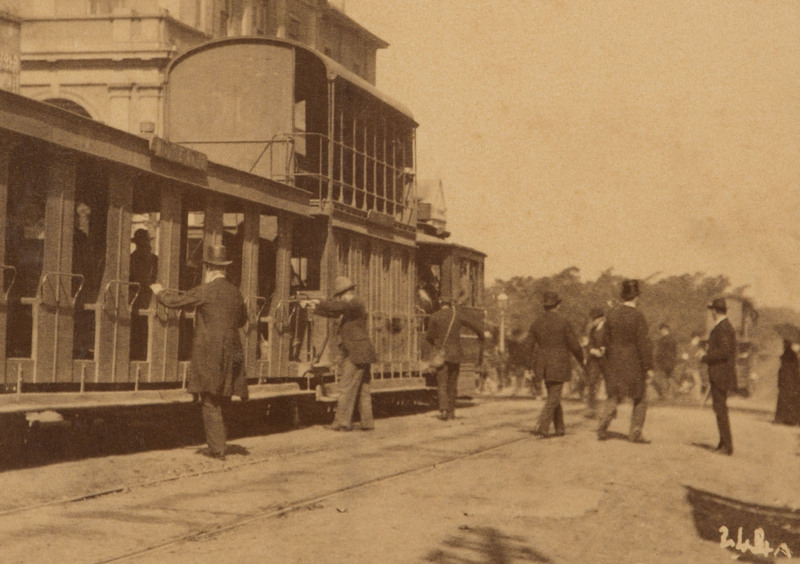 The man at left looks away from us with his back to the camera, while above him a man stands in the tram perpendicular to him, giving a nice play to the space between the tram carriages. 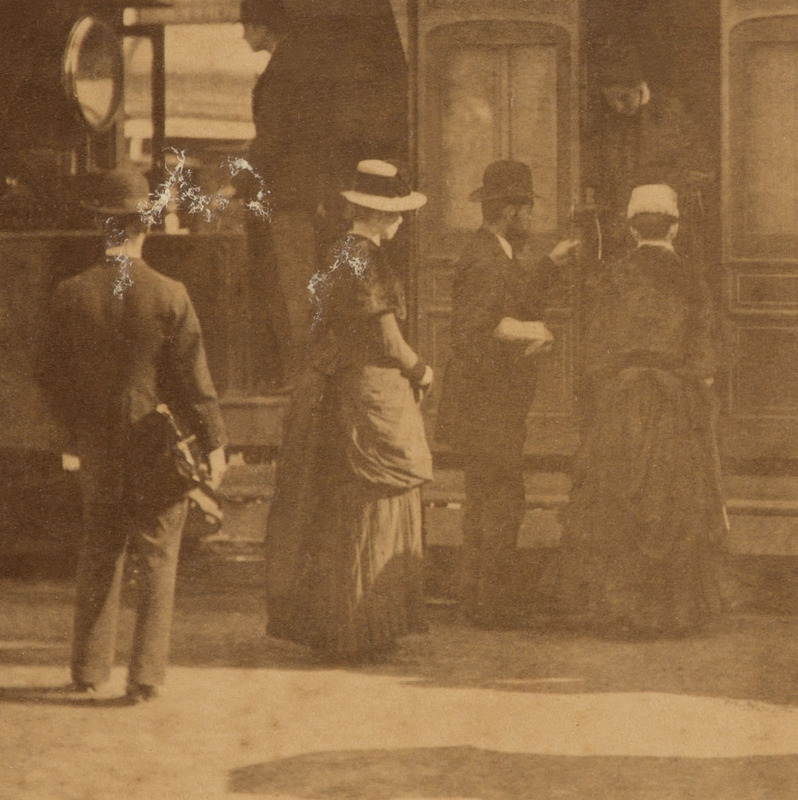 Three people in alternating dark and light hats wait patiently for a old biddie to descend from the open door of the tram, the man holding on to the hand rail of the tram ready to pull himself up, just as everyone still does on old trams in Melbourne to this day. 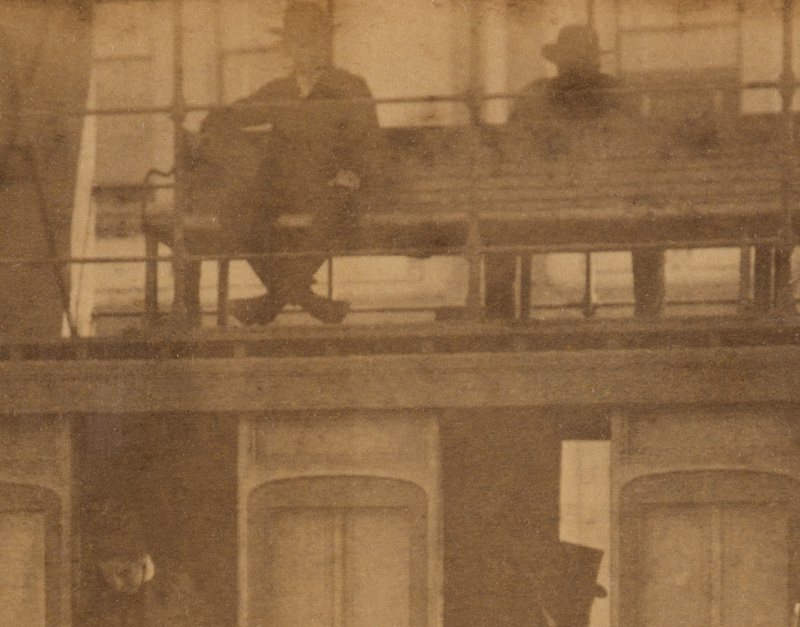 Above on the top deck sits a young man staring straight at the camera (without knowing it is there), with his legs crossed in a most unusual and uncomfortable way. Below him to the right a gent in a bowler hat talks with his wife, cigar stuck in his mouth. His facial outline, lit by the sun, is echoed in the darkness of the interior of the tram by another man with a beard and hat sitting in shadow. 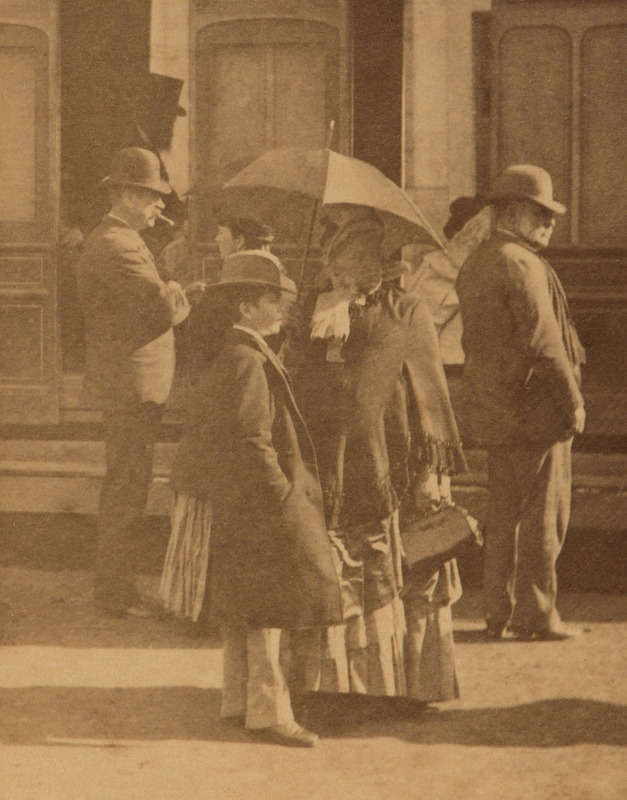 In front of this husband and wife is a son with his mother / grandmother – she, clutching her bag in heavy tassel-fringed cloak, protecting herself with umbrella against the sun – he, in long gents morning coat and hat looking very dapper. It must be mid afternoon by the length of the shadows cast by the sun. To the right of this pair is an older, heavy set man with great beard and hat, looking out of the image to the right. His gaze is cut across by a man sitting in the tram, all darkness and outline, beard and hat, looking out onto the scene from the interior. Finally, to ground the foreground of the image, there is a mother and daughter at bottom right of the image, with the small child clutching at the mother’s dress. The characters in this Dickens play rise and fall from left to right. They wash over you in their happenstance, frozen interaction. It is a superbly constructed image. Interesting as they are in their own vernacular way, it just makes the other images in this posting seem rather, well, prosaic. 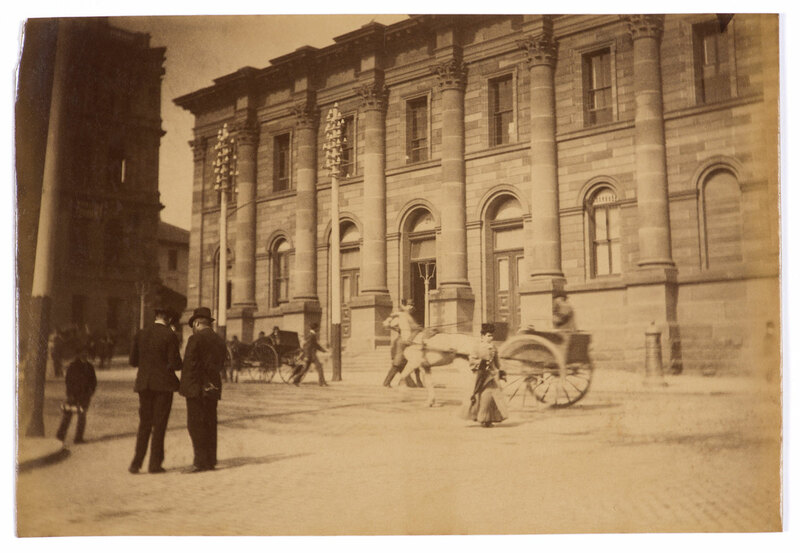 Many thankx to the State Library of New South Wales for allowing me to publish the photographs in the posting. Please click on the photographs for a larger version of the image. 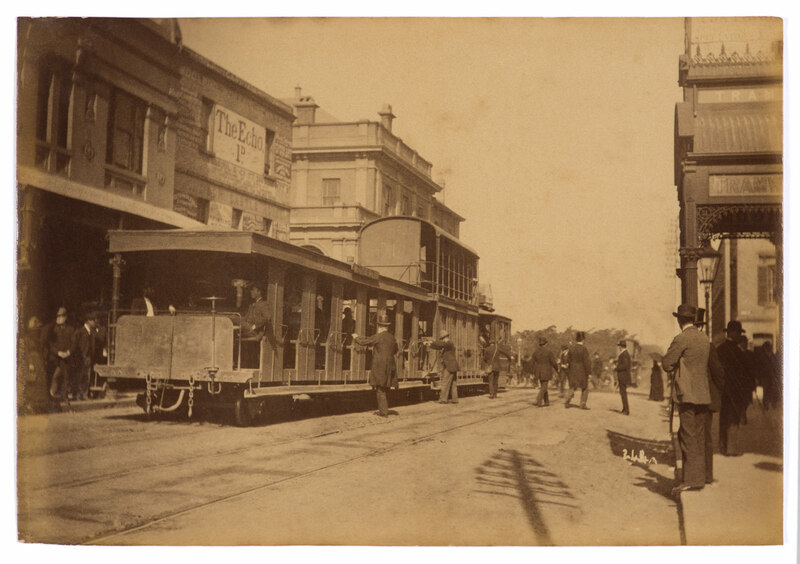 Forest Lodge double decker steam tram stopped on Elizabeth Street near Supreme Court N.S.W. 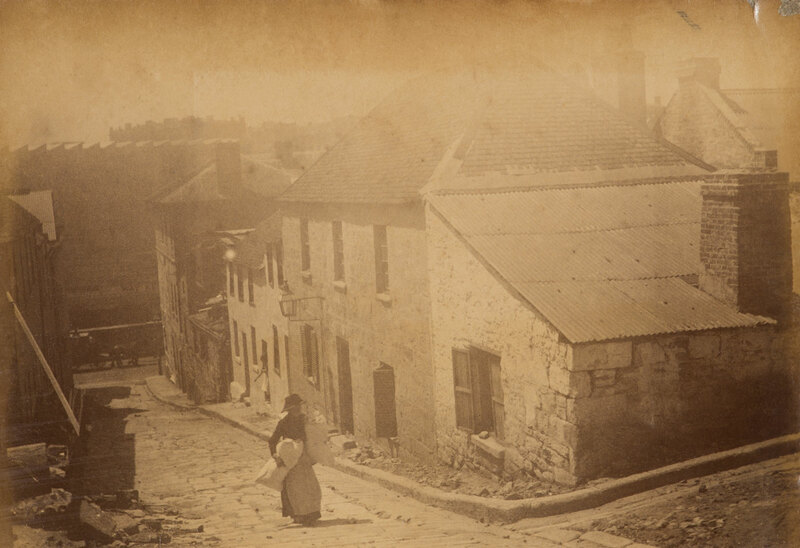 “Some of the world’s earliest street photographs, capturing many previously unseen views of Sydney from the 1880s will go on public display for the first time in a new exhibition opening at the State Library of NSW, from Saturday 4 April. 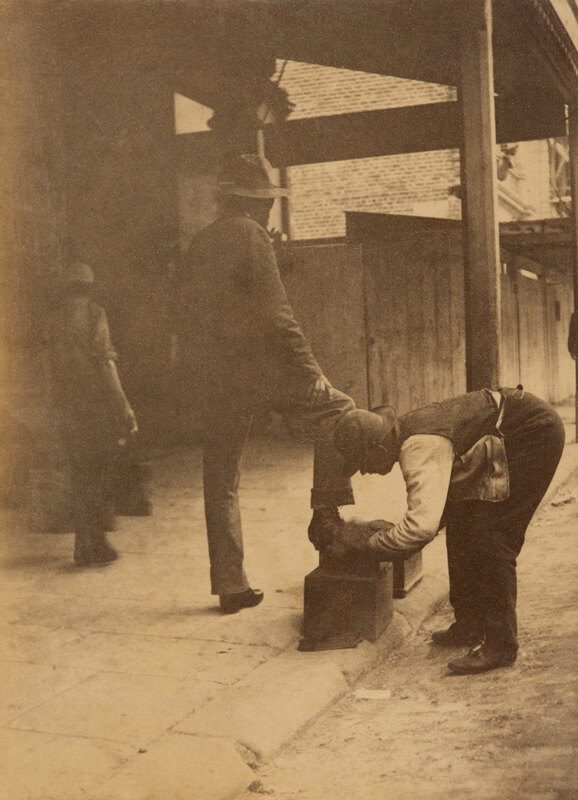 Crowd Source presents over 50 rare snapshots of Sydneysiders and Sydney’s bustling streets secretly taken with the world’s first hand‐held camera – branded the ‘Detective Camera’ – by amateur local photographer Arthur Syer. 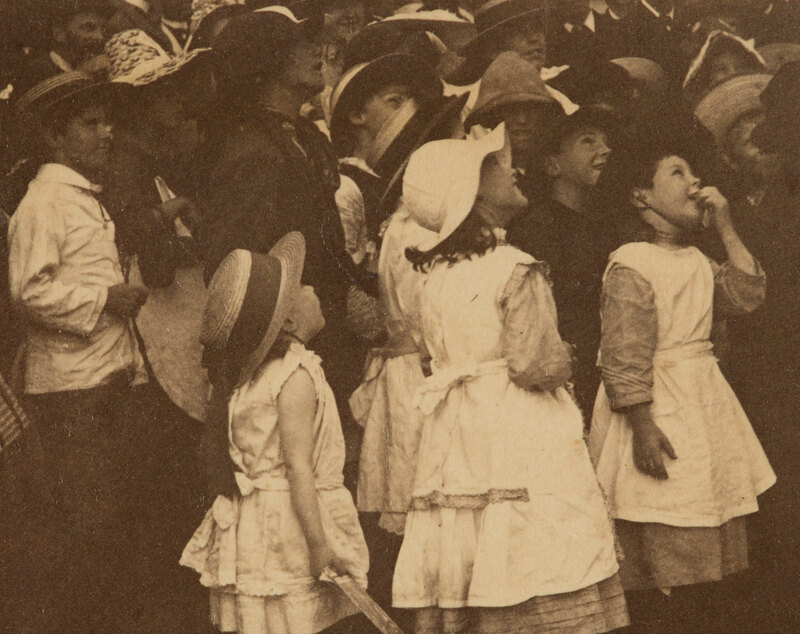 “Arthur Syer took candid photographs of ordinary people in everyday situations which he supplied to illustrators to use as ‘source material’ to help them create a life-like quality and characters in their drawings,” says exhibition co-curator Margot Riley. 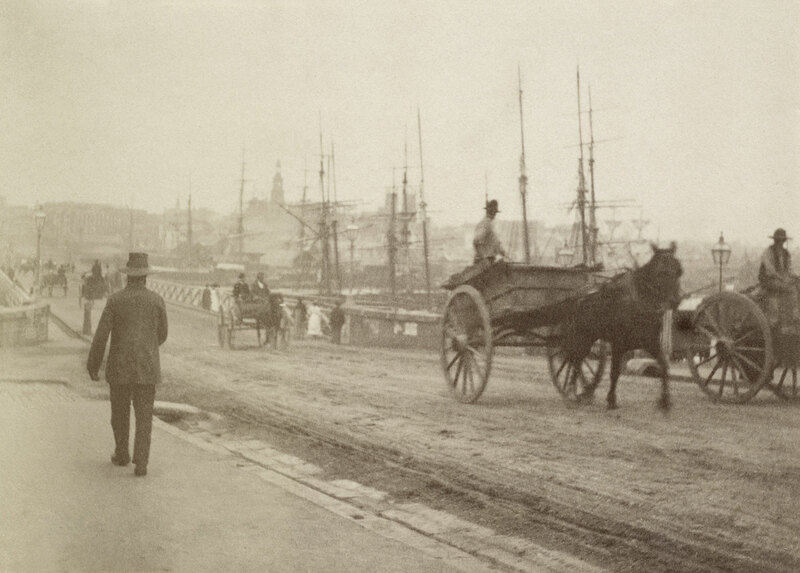 “Syer’s distinctive low angle photographs evocatively capture the buzz of 1880s Sydney showing the shoe-shiners and fruit sellers, road workers, transport deliveries and barrow shopping, queues at Circular Quay, children playing, shipping and scenes at the horses races,” said Ms Riley. Syer crossed into the publishing industry through his artist brother Walter, who introduced him to internationally renowned English cartoonist, Phil May. 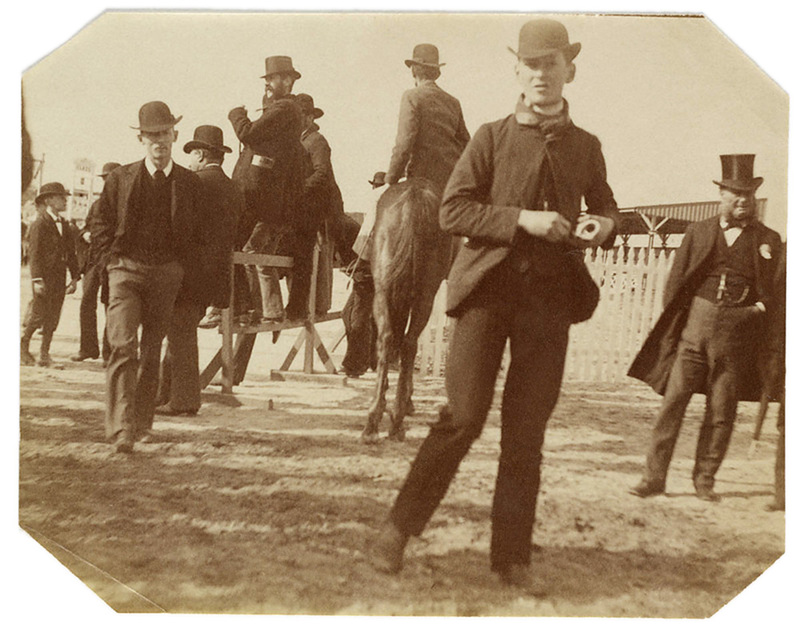 Invited to Sydney by The Bulletin in 1885, May often used Syer’s images to add authenticity to the backgrounds for his illustrations, for example drawings of people at the racecourse. 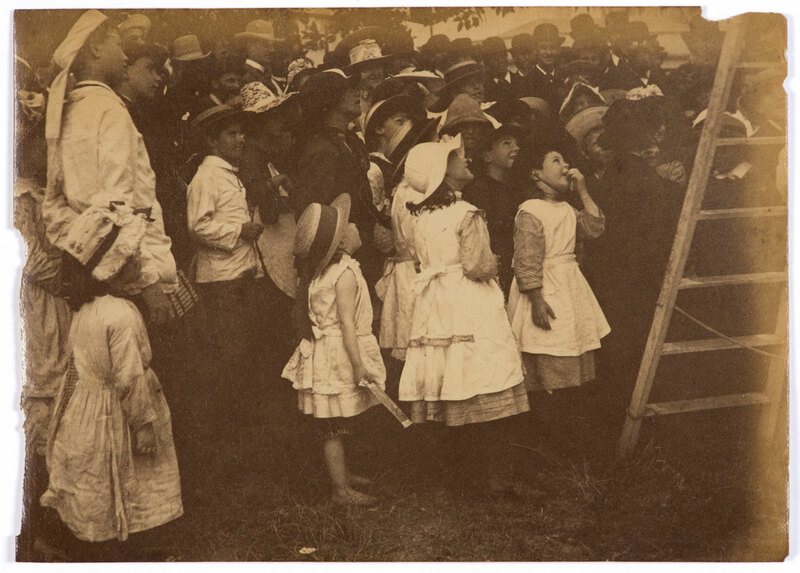 When the hand‐held camera was introduced in Australia in the mid‐1880s “it became a craze much like the smart phone or selfie stick of today, with photographs for the first time being able to be taken quickly and unnoticed,” said Ms Riley. The camera resembled “a square case… disguised as a … shoeblack’s box, or even a book. The operator places it upon the ground, or under his arm, the pressure of the pneumatic ball opening or closing the hidden lens at the required moment.” (The Sydney Mail, 2 July 1881). 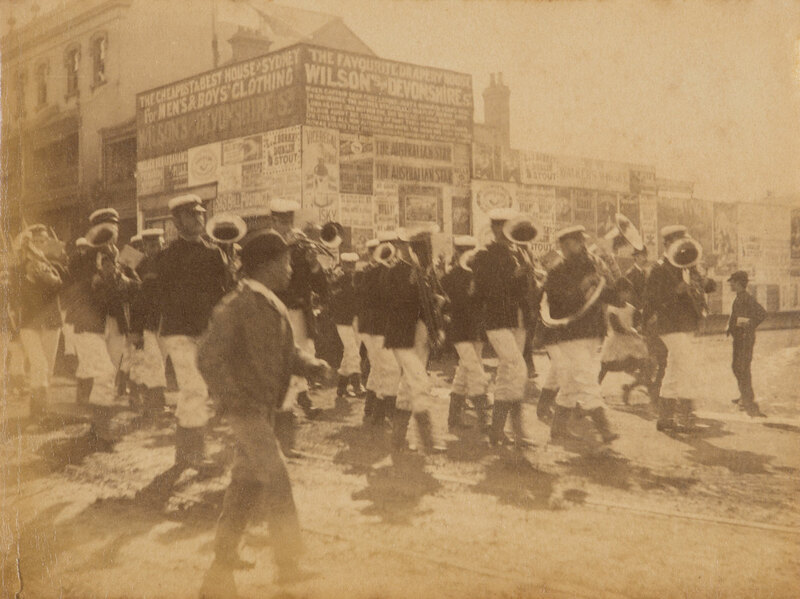 No skill was required to operate the Detective Camera, signalling the beginning of mass photography. 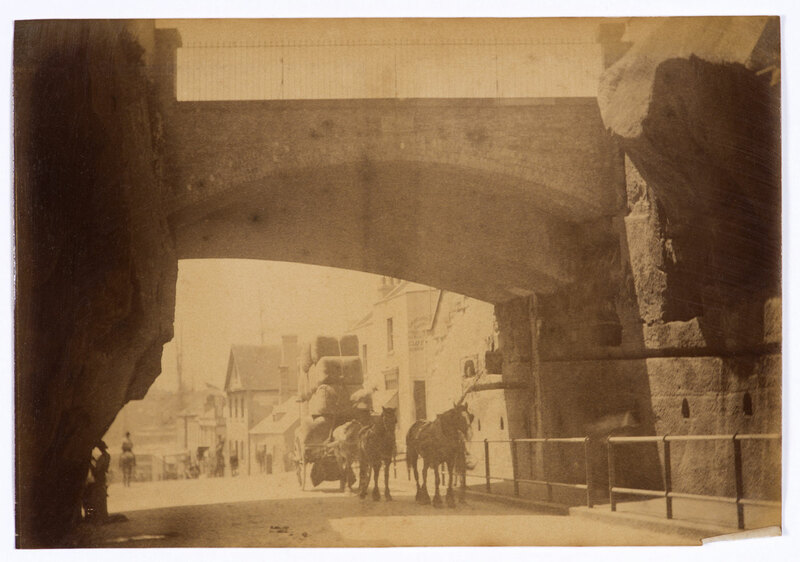 It used dry plate negatives – commercialised by George Eastman of Kodak fame – which were available over the counter at photography shops where negatives could be taken for developing and printing. 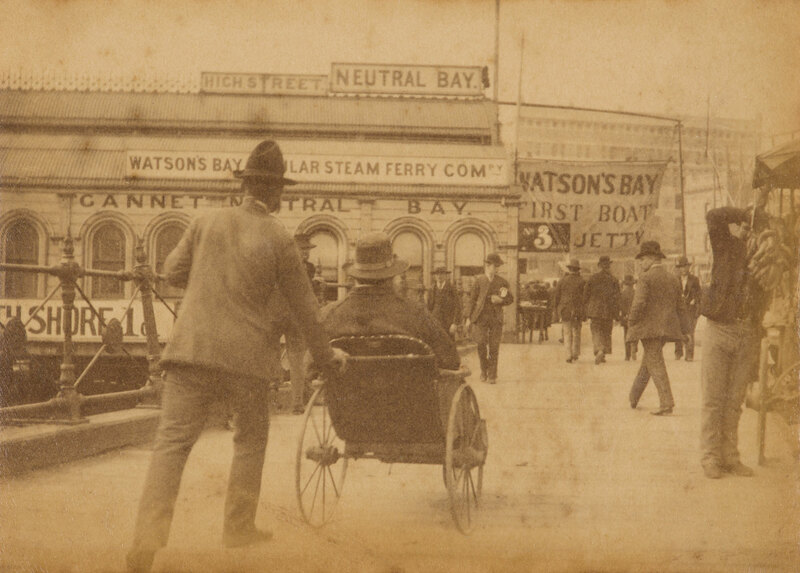 The State Library holds over 170 original Arthur Syer photographs – the most extensive collection of early Australian street photography known to exist. 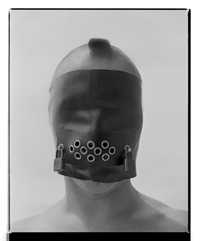 With the help of the Flickr community the Library has been able to label many of the images in the collection.